While the wet weather has some city slickers shaking their heads, farmers in southern Alberta are celebrating the recent rainfall. After a brutal winter, planting season finally started about a week ago and farmers say the rain is good news for the seeds they have spent long days sowing. "It's nice to get a little shot of rain right now. It helps everything to germinate," said Robert Page, who grows wheat, canola and peas with his father, Rick, near Carsland, Alta. "The seeding conditions are good and we've got most of it in the ground." Just 10 days ago, overnight temperatures hitting -10 C had Page concerned. A late start to the growing season means a higher risk the crop could be ruined by frost come September — so the earlier farmers can plant, the better the prognosis for the crop yield. 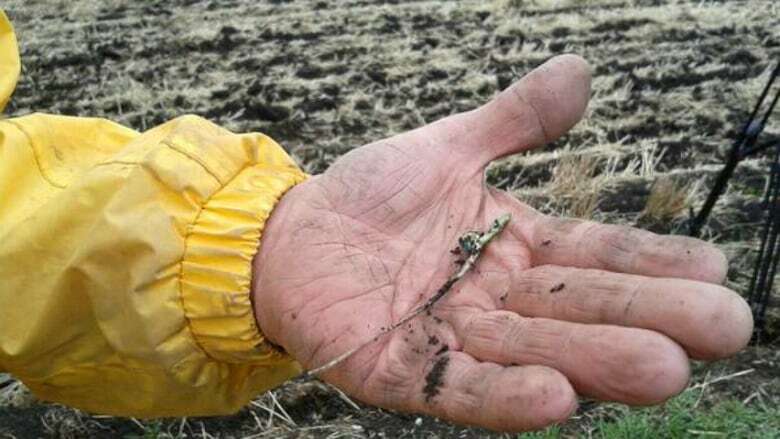 The slow start to spring in Alberta had some farmers concerned, but most have been able to start planting. Rick says they were able to start planting their crops of wheat, barley, flax, canola and peas about a week ago. Since then, the wheat and peas have started to sprout and both say they are hopeful that this will lead to a good year. "Optimistic, right now," Robert said. "Things can change in a hurry but right now, they're optimistic." Last year, a bumper crop across the Prairies led to a backlog of grain as farmers struggled to get their yields to market. Many are still concerned about how that will play out later this year, but the Pages say those closest to the grain terminals haven't had things so bad. "We're not overly concerned in this area," said Robert. "I know there's a lot of people in other areas that haven't moved any but we're fairly fortunate." But selling a crop like wheat also means a lot of work. Not just on the field, but with watching prices — something the Canadian Wheat Board used to do for farmers. Up to $20 billion worth of crops was stuck in storage as of late March, according to the Canadian government. Economists predict the impact of that backlog will persist for years to come, as many farmers struggle with a cash crunch. However, it seems many in southern Alberta are still optimistic about this year's growing season. "As long as we get some heat and get things warmed up, it should be another good year," said Rick. "It seems to be coming along better — but we'll see."